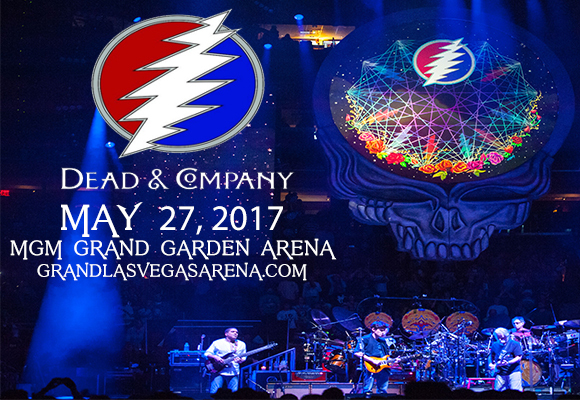 Sought-after supergroup Dead & Company comes to MGM Grand Garden Arena on Saturday 27th May 2017 as part of their 2017 tour! The band, which features three of the four "core" members of the Grateful Dead, as well as frontman John Mayer, will be playing their signature blend of progressive psychedelia, and paying homage to the music of the Dead! Dead and Company is a band comprised of former Grateful Dead members Bob Weir (guitar), Mickey Hart (drums), and Bill Kreutzmann (drums), as well as multi-platinum selling Grammy Award-winner John Mayer (guitar), Grammy Award-winning virtuoso Oteil Burbridge (bass), and Bob Weir & RatDog band member Jeff Chimenti (keyboards). In 2011, Mayer stumbled across a Grateful Dead song online and became obsessed with the band. Four years later, Mayer was guest hosting the The Late Late Show, and invited Weir to join him in a studio performance. The two bonded, and Mayer dedicated himself to learning the Grateful Dead back catalogue while the surviving members of the band prepared for their hugely successful Fare Thee Well Tour. The band initially announced one concert for October 31 at Madison Square Garden in New York, but response was so positive, they added a further 21 shows and developed it into a full tour.